This course is part of the Basics and Beyond series consisting of 20 chapters. It is exceptional for CHT exam preparation as well as to sharpen your clinical skills. Available as a single course or in bundles. Click Here! This Basics and Beyond course is an Exploring Hand Therapy (EHT) online E-book which is part of a series consisting of 20 chapters. 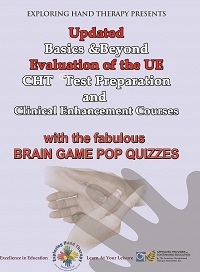 It is exceptional for CHT exam preparation as well as to sharpen your clinical skills. Available as a single course or in bundles. For discounts Click Here! BB Evaluation focuses on key areas to improve your evaluation process necessary for all patients to help identify problem areas, establishes a baseline of functional performance, and provides us with an attainable Plan of Care (POC). Specific details are covered in more depth in each individual course subject matter. This course is great to gain your foundation. Mixed level: Intermediate. Online digital book, with 4 video clips, numerous photos, 8 Brain Game quizzes throughout the course to solidify your knowledge. ONLINE LIVE CHAT and discussion board. 80% to redeem your certificate via an online exam consisting of <20 questions. Certificate will be immediately emailed to you upon successful completion. This course has 8 Brain Game "pop-up" quizzes throughout the course content, numerous photos and 4 video clips to enhance your learning. This course has "live chat" feature with an EHT moderator during the course and it has a discussion room for course participant interaction. Qty Discount Available with this item. Click Here for details.